You have a serious car accident. Officers arrive and investigate. They issue a citation and write a report. The officers are wearing body-worn video cameras and their cars have dash-cam video. When the officers finish their preliminary onsite investigation, they hand you a code. The next day you go online to the Seattle Police Department website. You key in the code and all the information regarding the collision is available—the videos with a written transcript, the officers’ reports, the citation, the sketches and photographs of the accident scene, witness statements, and maybe even a history of other collisions and problems at that intersection. That was just one vision of the future laid out at a body-cam video workshop hosted by the Seattle PD in June. The workshop included officers from the Orlando, Louisville, and Dallas police departments, plus representatives of the Police Foundation, Code for America and Socrata, the company that powers the city’s open data portals, including data.gov and data.seattle.gov. 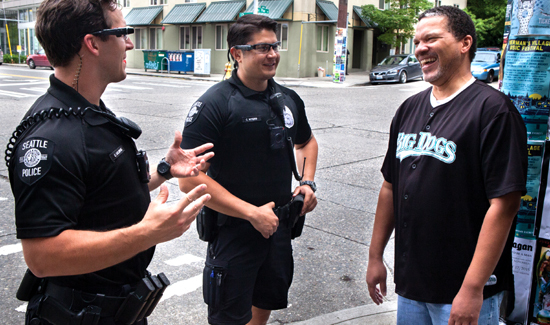 As they kicked off the workshop, Seattle Mayor Ed Murray and Police Chief Kathleen O’Toole reiterated their support for getting body-worn video cameras for every one of Seattle’s 600-plus patrol officers. The Chief had nothing but the highest praise for the Department’s chief operating officer, Mike Wagers. His leadership, she said, has been crucial to resolving the complex issues that have arisen during the initial deployment of body cams. Wagers hosted Seattle’s first-ever “hackathon” last December. One big issue to resolve was how to redact the faces of victims, witnesses, and juveniles from the videos before releasing them to the public. Wagers made the decision to hire long-time Seattle PD critic and open-government activist Tim Clemans to help solve the redacting issue. “You did what?” O’Toole recalled saying to Wagers after he told her he had hired a hacker to work on redaction. “Hiring a police department critic was an act of brilliance,” Mayor Ed Murray added. During the workshop in June, hacker-turned-police-department-employee Tim Clemans talked about the great progress the Seattle PD had made since December’s hackathon. Mary Perry, a city attorney and advisor to the Seattle PD’s Public Disclosure Unit, emphasized that the state of Washington has a very open public records act—there are very few grounds for withholding video from the public. But it is essential, Perry said, to protect the identity of victims and juveniles by redacting those records. Seattle PD’s Bob Mead described the pilot program involving a small group of Seattle officers patrolling in cars, on bikes and on foot. The Department, Mead said, is testing two cameras—Vievu and Axon, manufactured by Taser International. The Seattle PD has already uploaded 2,925 redacted videos to YouTube. The list is on the city’s open data site, hosted by Socrata. But Mike Wagers, the department’s chief operating officer, emphasized that widespread deployment of body-video cameras on police officers is not a panacea. Officers from the Orlando, Louisville, and Dallas police departments attending the workshop agreed that redaction is the major problem preventing more widespread use of body cams. Florida has a sunshine law similar to Washington’s Public Records Act, requiring disclosure of almost all video when requested. The Orlando Police Department was having few problems providing requested videos until recent citizen complaints about use-of-force incidents resulted in a rash of requests, as well as demands that all Orlando officers wear body cams. Dallas officials talked about the need for more officer training and more outreach so their officers will better understand the value the videos have in strengthening the case against the suspect, as well as protecting the officer against bogus claims of excessive force. The Oakland Police Department is working with Stanford University to use its five years of videos to improve officer training and to help police officers learn to de-escalate confrontational situations. Representatives from both Vievu and Taser talked about how their companies are addressing the problems associated with managing storage, privacy issues, and complying with open-records laws. Taser and Vievu are actively pursuing video redaction technologies and both already offer automated transcription, where the audio connected to a video is converted to a written transcript via voice-to-text software. Both companies say they are committed to “public portals” where redacted versions of the videos will be available for public viewing. There are other challenges as well. Linking video to both the computer-aided dispatch (CAD) and the records management (RMS) systems is a challenge. Every time police are dispatched, a record of the event is created in CAD. Every time a crime is reported, an incident report is filed in the RMS system. But right now there is no way to link either CAD or RMS records to videos of the same incidents. One idea is to have officers flag videos needing redaction and add identifying tags, such as the CAD incident number, description of the event, type of crime, and so forth. However, all this work ties up an officer in the field who now has to be looking down and typing into a computer or smart phone rather than actively patrolling and watching for crime. One participant noted that software that allows speech-to-text processing might help solve this problem. How to start and stop the recording process is another problem. With dash-cam video, the dash cam automatically starts when the overhead red-and-blue lights are activated. Most body-worn cameras need to be activated by the officer. But if the officer is confronted with a sudden, urgent, situation, such as a person pulling a weapon, he or she will not have time to activate the camera. Several people mentioned that perhaps technology might be developed to automatically activate the cameras. Privacy concerns were also on the agenda. Michael Mattmiller, Seattle’s chief technology officer, spoke about Mayor Murray’s “Seattle Privacy Initiative,” which pledges to value the privacy of the city’s citizens as one of its core principles. Mattmiller talked about the city’s desire to collect only the data that is necessary from Seattle’s residents to render services more efficiently, such as providing water or a license for a business. Ron Smith, president of the Seattle Police Officers Guild, has been working with Chief O’Toole right from the beginning. Having a seat at the table has worked well for the department and the cops who are out on the street. Smith added that the latest contract included a clause about the pilot program. When the program goes department-wide, a permanent body cam policy will be negotiated into the contract. Greg Russell, chief information officer for the Seattle Police Department, said he hoped that, at some point in the future, body-worn video footage might be live-streamed, automatically redacted, and put on a public website all in one process. The workshop was a resounding success and plans are underway to organize something similar in the future. Reprinted with permission from the publication Geekwire. Bill Schrier retired after eight years as the chief technology officer and director of the Department of Information Technology at the City of Seattle. He chairs the Washington State Interoperability Executive Committee charged with improving radio communications for first responders.